These are the words that calms his little mind just before he drifts off to sleep every night. Just the other day he was dreading his first karate class even though he had been dying to do it. After my daughter thought it would be fun to show Karate Kid for “movie night” in celebration of his new upcoming activity, my grandson had gotten it in his head that he may get “beat up” in karate class. This needless worry sucked all the excitement right out of the little fellow and filled him with fear, despite my daughter’s attempt to rectify this misconception. On the big day of his first karate class, my grandson voiced his dread all the way up until time to go. It was a bit humorous and very pitiful. 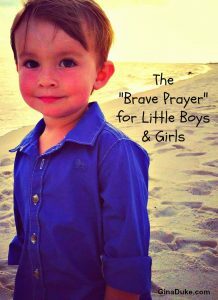 I texted my daughter to tell him that I had said the “Brave Prayer” for him that day. A little later, she sent me a video of a brave little boy in a new karategi enjoying his first karate class. Are you battling fear? Are you consumed with dread? Do you have a Brave Prayer? 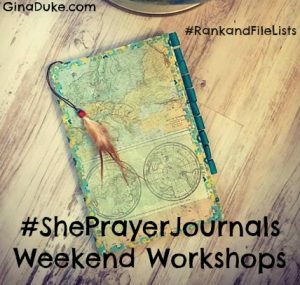 My prayer journal workshop is about a lot of things, but one of the hightlights is regarding my new lists project that I called #RankandFileLists. One of the lists I’ve made is of spiritual mentors. 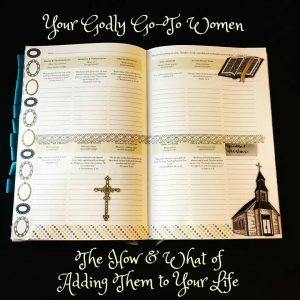 Do you know how important it is to have godly go-to women in your life??? I’ve got several important things to say about this. So, on to the video workshop!! !